We want our friends, our children, our leaders to have integrity, and not to compromise it – and we think we can recognize it when we see it. So to understand what integrity is, and what it means for us, we should look to those that have it. 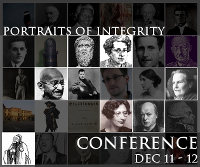 This conference will share a series of detailed portraits of historical, fictional, and contemporary figures whose lives raise questions about what integrity is, what it is worth, how it is enabled or endangered, and at what cost. Contributions are from a range of disciplinary perspectives. A variety of detailed portraits of integrity bring along a range of ways of conceptualizing what this integrity is, and the role it plays in an individual and in people’s lives, and together these will bring to light what matters to us in this central but elusive value. As consideration of cases shows, integrity is not always pretty. People of integrity look stubborn to others and careless of consequences. Can one have the things that are valuable in integrity while maintaining one’s humanity? The submission deadline has now passed, but we will welcome contributions (of up to 3,000 words) for publication in our conference programme and in our website journal. Thanks to the generous support of the British Academy and Durham University there will be no registration fee. However, places are limited, so please register above.